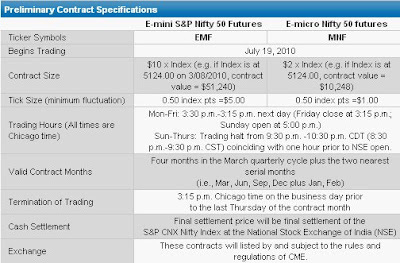 CME Group in partnership with the National Stock Exchange of India (NSE) and Standard & Poor’s is to offer S&P CNX Nifty Futures, nearly round-the-clock trading on the CME Globex platform.The institutions now have two new ways to take part in the dynamic opportunities of the Indian stock market - E-mini and E-micro S&P CNX Nifty futures (Nifty 50 futures) which are scheduled to begin trading on Monday, July 19, 2010. Trading hours will be Monday-Friday, 3:30 p.m. – 3:15 p.m. the next day (except Friday, which closes at 3:15 p.m.) with a trading halt. Sundays-Thursdays from 9:30-10:30 p.m. CDT (8:30 p.m.-9:30 p.m. CST) coinciding with the hour prior to the NSE opening. This is an interesting listing, thereby providing the Global Institutions to gain exposure to the Indian markets and also arbitrage opportunities from short-term price differences versus the Singapore SGX Nifty futures. And will this cause any changes in NSE's Trading hours or Nifty futures trading in NSE ? One has to wait and see ! Nifty futures going global ! @Janak, you are right. But it would put lot of pressure on exchanges as well as for traders. It is unlikely as of now.